A little over a month ago, Dan Barber, celebrity chef/food advocate of Blue Hill and Blue Hill at Stone Barns restaurants, and Shaun Donovan, Secretary of the U.S. Department of Housing and Urban Development, were guests at the Dalton School's Conversation Series on the Upper East Side (they are both Dalton grads and so am I).I was really excited to post about the passionate and informative evening on Lighthearted Locavore back in December, then I got busy, misplaced my notebook, cooked up a storm for Christmas, went on a ski vacation -- you get the picture. I just found the notes on the story-filled evening..... Dan and Shaun are both on the national scene and members of the inner circle of President Obama and our First Lady. And, besides being "friends of Barack and Michelle", and graduates of Dalton of course, Dan's and Shaun's fathers played tennis together in the 1970s and as young boys they visited Blue Hill Farm in Massachusetts together where Barber's grandmother had a family farm. In a pact of friendship, they buried a stick near a tree on the farm. As adults, they were thrown together at a pre-inauguration dinner party just a year ago at Bob Woodward's house in DC (read about the dinner here). Dan Barber and Alice Waters and other famous chefs cooked the meal and Donovan, as the incoming HUD secretary, was a guest. Between courses, Barber, in a playful and humorous way made sure he got his top issue on the national (and Donovan's) agenda: "As Secretary of HUD, what are you going to do about food, Shaun?" According to the NY Times blog post there was also talk of a White House Garden at Woodward's house. After a few minutes of charming stories, and a couple of good laughs -- both guys are lighthearted and funny and really, really smart-- Barber and Donovan gave their audience a glimpse into the most pressing of issues around food and shelter and the critical linkages between the two. --and the my fave in Barber's words "the food revolution"
Dan and Shaun totally get it! And, they really care about the issues. Barber talked about "date night" at Blue Hill in Greenwich Village when the Obamas showed up for dinner last winter. "We need a more resilient food system that relies on the sun" and not high energy inputs remarked Dan. There's more demand for "food that tastes delicious", he said.Shaun mentioned Seattle's "green belt" and urban farms and how open spaces for food production is now in that city's zoning codes. And, talked about NYC Housing Department's Via Verde in the South Bronx with a green rooftop garden and farmers market in the courtyard. Before the evening came to a close, there was talk about reading Thoreau in English Class at Dalton, being class president, bridge games. Oh, and the carrots, let's not forget the carrots. When talking about the education program at Stone Barns and getting kids interested in fruits and veggies vs. processed foods, Barber claimed, wide-eyed and smiling, that the carrots grown at Stone Barns are the best, the sweetest and most delicious carrots that kid's ever tasted. "My carrots, with a sugar percentage of 10.9 are sweeter than any carrot shipped in from California". Kids love 'em. 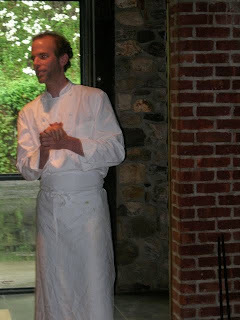 I look forward to more meals at Blue Hill and keeping an eye on these two superstars. I'm proud to be a Dalton Alum and thrilled I shared in this intimate and informative evening.